As if looking into long forgotten memories of another life, emotionally charged photography and prose explore an outsider's feeling of loneliness and coming to terms with one's purpose in a trip through the life of leading Japanese tree house creator, Takashi Kobayashi. Takashi Kobayashi, a popular tree house creator, featured in the New York Times and on many television programs, newspapers, and magazines, examines being an outcast in a rigid society of rules and conformity and finding salvation in the trees. The author's photography and writings, accompanied by the poetry of William Blake, adorn this alternative to your average tree house book. This title takes things one step further by describing how tree house living is a lifestyle and philosophy, not simply a means of making coffee table books. 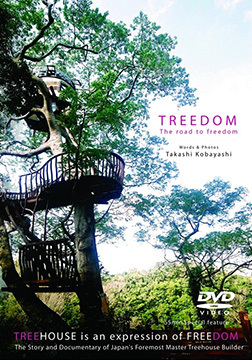 The accompanying DVD documentary is based on a trip he made to Oregon City and features a 2006 tree house making film in Okinawa and Hokkaido, Japan. This is the first book written by a tree house creator that has been featured in New York Times and various other media outlets. In creating Treedom, the popular author of LOVE & FREE New York Edition, Ayumu Takahashi and the designer Naoto Yokota join the production. Designer, Naoto Yokota, recognized world wide, has been awarded the IF design award in Germany and Good Design Award in Japan. The work LOVE & FREE New York Edition has been recognized as an artwork on sale at New York City's MOMA (Museum of Modern Art). Born in Shizuoka prefecture in 1957, Takashi Kobayashi, is a tree house creator. As a pioneer in Japan, he creates tree houses based on style, design, and sensitivity. In 1994, he met the world authority of tree house architects, Peter Nelson, and took a part in the annual World Tree House Conference held in Oregon as the only Japanese participant. He started the Japan Tree House Network in 2000, and establishes Tree House Creation LLC in 2005. Interacting with tree house builders and tree doctors around the world, he shares information on latest technology, designs and dendrology of tree houses. Takashi creates tree houses all over Japan taking into account the climate and tree materials in each area. He also remodels apartments in Tokyo encompassing old cedar in back streets. Takashi currently manages the salon, "HIDEAWAY", offering information on tree houses, shopping, and reference. He proposes a value in natural and healthy living by believing in engrossing amusement, pursuing dreams, and learning from those experiences.